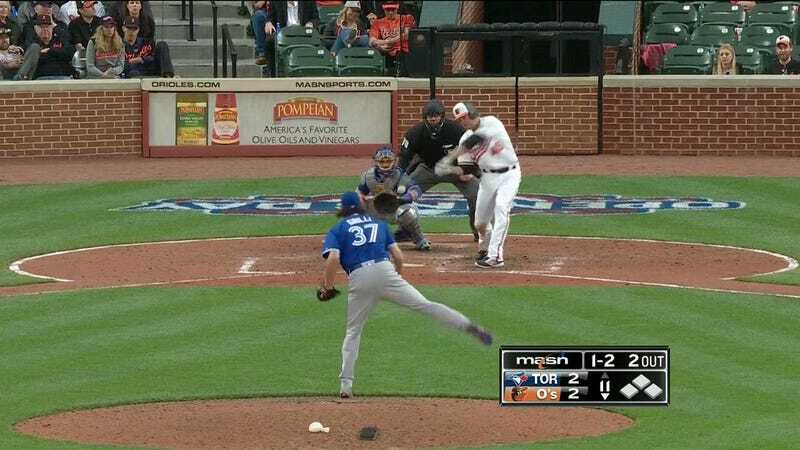 The home run factory that is the Baltimore Orioles picked up right where it left off last season in its Opening Day game against the Toronto Blue Jays—the team that beat them in the AL Wild Card game last year. Tied 2-2 in the bottom of the 11th inning with two outs and two strikes, the Orioles’ Mark Trumbo feasted on a stagnant slider, knocking it to the left field stands as the crowd at Camden Yards went wild. This dinger is a glimpse of what to expect from Trumbo, who led baseball with 47 homers last year. He may have sealed the win, but if it hadn’t been for third baseman Manny Machado’s diving stop and incredible throw to first in the top of the 11th, the Blue Jays could have won instead. Chris Davis and Trumbo each batted in runs in the third inning, the Blue Jays got one back in the fifth, and then scored to tie it up in the sixth on a Ezequiel Carrera double. Four scoreless innings passed before Trumbo did what Trumbo does, and the Orioles, who led the league in homers last year with 253, notched their first of the season.